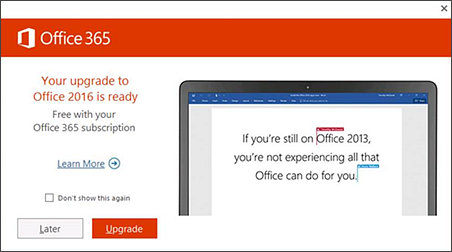 If you're still using Office 2013 with your Office 365 subscription, you'll eventually receive notifications to upgrade to Office 2016. If you don't want to have to dismiss the notification each time you launch an Office 2013 application, follow the steps below to permanently disable this notification. The following steps won't turn off any notifications that tell you to update Office with the latest security features and product updates. It's critical you apply those type of updates to Office. Ensure you have the latest Office updates by following the steps in the section, "Get Office 2013 updates" in Install Office updates. Download this easy fix to have it set the registry key for you. Setting this registry key will disable the "Get the New Office" upgrade prompt. If you're an Office 365 for business administrator and want to know how to prevent Office 365 ProPlus 2013 from being automatically updated to Office 2016, see How do I keep on running Office 365 ProPlus 2013?